I promised to share you with all the latest news and gossip from the team at Camp Bestival and what a lot of lovely news we have today. Starting with something which I find really exciting. How many hours of the week do your children spend in front of a screen of some kind? Be it at school, in the lounge or in their bedrooms….and it’s not just children. As a blogger I am all too comfortable spending my days looking at my iPad or smartphone and I will admit that some days I have to actively make myself take time away. We went to a local beauty spot over the bank holiday for a day of BBQ’s and games with some friends and family. There was so signal on phones and we left everything else at home. It was a whole day of relaxing and just enjoying being outside. Lying on grass, being chewed on my various flying insects and throwing a frisbee at each other. It felt so peaceful. I remember days like that from my childhood and it worries me that my children are of the generation who won’t see as many days like that. It’s my job to make sure they do. 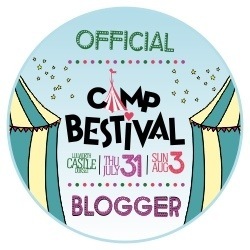 Anyway this is supposed to be about Camp Bestival (not my parenting) and so I will tell you about one of my favourite new features of this years fest. Team CB have teamed up with Project Wild Thing: a new and unique, people-powered movement to help children and adults reconnect with nature. Sounds good yes? And so much more. I am so excited about it all. More so by the fact that Izzy can be so much more involved this year. I can’t wait to be a wild thing. That’s not it though. Even more was announced today ..
Get your checked shirts and straw hats ready to join in with barn dancing squad Cut A Shine. Caravanserai is a convoy of English and French artists, gypsies and beatniks who have set up an encampment for weary travellers and wanderers to rest and recharge. You can enjoy delicious cocktails while completely chilling out during the day and party on during the night. Dedicated to the memory of John Peel and his Pig’s Big 78 selections, it’s programmed by the Shellac Collective and Greg’s Greats and is a mind-blowingly amazing dance arena. It’s officially time to start counting down 59 days ago…. Look forward of seeing you all there.